For a show without a host and, crucially, without a Best Picture mix-up, there was still a whole lot to talk about when the Oscars 2019 was all said and done. There were rabbit puppets, big impromptu Samuel L. Jackson celebrations, an angry response to one of the big Oscar winners, and so much more besides that. Here’s everything you missed from the Oscars 2019 and, yes, Olivia Colman’s terrific acceptance speech is here too. 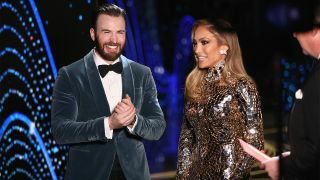 Not only did Chris Evans kick off the night by unleashing his inner MCU hero by helping Best Supporting Actress Regina King up on stage after nearly tripping, he also decided to fanboy and reveal the result of a Black Panther Oscar win a little too soon by fist-pumping. Spoilers, Chris! Maya Rudolph, Tina Fey, and Amy Poehler are brilliant. I know it, you know it, and the entire Academy surely know it after last night’s tour-de-force of a display that made us wonder what it’d be like if the trio got the job in 2020. Pretty please? Having no Oscars host meant that some presenting duos, inevitably, tried to upstage the rest. They needn’t have bothered. That’s because Spider-Man: Into the Spider-Verse’s Brian Tyree Henry and Can You Ever Forgive Me? 's Melissa McCarthy managed to steal the show with a set of free-flowing frocks, inspired by the costume design of The Favourite. McCarthy even got to use a rabbit puppet, which is something I’d never thought I’d say about the Oscars! The Oscars isn’t just about celebrating the last year in movies; it’s also about celebrating the lives of those who we’ve lost. You can watch the full in memoriam video here. Stan Lee even shows up (skip to 2.52 to see the comic book legends moment), which is nice. It’s now the most-awarded song in history, but we still can’t get enough of Shallow from Lady Gaga and Bradley Cooper’s A Star is Born. They tore the house down, too, with a spine-tingling rendition of the signature song from the soundtrack. Director Spike Lee had quite the evening. Early on, he was given an impromptu man-hug by Samuel L. Jackson after picking up the Oscar for Best Adapted Screenplay for his film BlackKklansman and, by the night’s end, he was abruptly heading for the exit after being more than a little bit annoyed at Green Book’s Best Picture win. This is a perfect place to end, isn’t it? A speech that was at once so sweet, inspirational, funny, and 100% awkwardly British managed to capture the hearts and minds of the Hollywood elite. Olivia Colman is a treasure – and you can watch her speech in full below. If you can't get enough of the 2019 Oscars, why not read about one writer's attempt to marathon EVERY Best Picture nominee in four days... while sick.